The Log of a Cowboy is an account of a five-month drive of 3,000 cattle from Brownsville, Texas, to Montana in 1882 along the Great Western Cattle Trail. 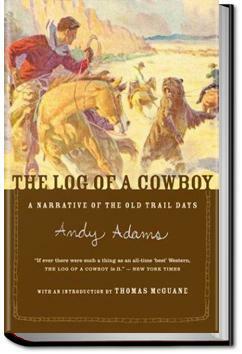 Although the book is fiction, it is firmly based on Adams's own experiences on the trail, and it is considered by many to be the best account of cowboy life in literature. Adams was disgusted by the unrealistic cowboy fiction being published in his day; The Log of a Cowboy was his response. It is still in print, and even modern reviewers consider it a compelling classic. . . .Carpet that made you think you were going to bog down every step, springy like marsh land, and I was glad I came. Then the younger children were ordered to retire, and shortly afterward the man and his wife followed suit. Well-written account of a cattle drive from Texas to Montana in the year 1882. For the first time I understood what cowboys actually did in addition to strumming guitars and blasting away with their six-shooters - though they do some of that too. I read this many years ago. As I recall, it is very true account of the early days and life on the cattle drives. Many of these came through New Mexico and many of the drovers were Hispanic.